It’s important to strike a balance between safety and ease of operation with high-ampere devices. Our new X-CONTACT sleeves achieve this balance. This system features a flexible, slotted design that significantly reduces mating forces while maintaining the durability and reliability required for industrial wiring devices. Mating 60/63A and 100/125A devices can be difficult. The size of the plug and stiffness of the contact system often requires more than one person to make the connection. This interrupts the work process but also presents a hazard both environmentally and from heat rise if devices are not fully mated. Industrial environments require robust plugs and connectors but must be practical to use. The MENNEKES X-CONTACT achieves this goal through use of advanced materials, along with X-shaped slots and internal grooves. Insertion and extraction forces are reduced by up to 50% with X-CONTACT thus facilitating proper use in all operating environments. The X-CONTACT’s inner walls feature grooves that are perpendicular to the connection direction, creating a highly flexible yet robust contact closure. This provides a row of contact points for a flexible and reliable connection when inserting or disconnecting a plug under load. The grooves of the X-CONTACT sleeves have another purpose: they remove contaminants from the pin, maintaining smooth operation and minimizing heat rise without spring elements that often accumulate dirt. The X-CONTACT sleeves can even remove surface corrosion from pins. A nickel-plated option offers greater resistance against humidity, salt and varied chemical substances. 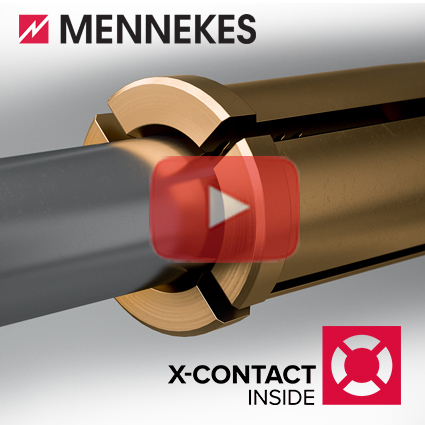 To learn more about the X-CONTACT, watch our new video. Designing an AMAXX Custom Power Distribution Center is as easy as a few clicks! The AMAXX line features 5 sizes of UL listed non-metallic enclosures and unlimited combinations of receptacles and disconnects. Our switched and interlocked receptacles provide safety and durability in one pre-wired unit. Available in 20A-100A, interlocks prevent the switch from being turned “ON” unless the plug is fully inserted. The plug cannot be removed unless the switched is turned “OFF”. The AMAXX product line combines multiple interlocks and a convenience outlet or other receptacle device into one enclosure. MENNEKES offers a complete line of Sloped-Top Stainless Enclosures including 25A-100A Motor Disconnects. Units are Lockout/Tagout compliant and have built in auxiliary contacts for VFD and starter interface. A 15º sloped roof facilitates runoff of liquids and cleaning residue in processing areas. Blank enclosures and pushbutton enclosures are also available. Need 60A utility power and a convenience outlet? Why install 2 boxes? With AMAXX by MENNEKES combine both into one enclosure. Choose from 5 enclosure sizes, various receptacle standards, motor disconnects, switched receptacles and add overcurrent protection if needed. One AMAXX enclosure can save you time, money and space. Innovative modular design facilitates quick delivery.